Are you looking for a mobile locksmith around Surry Hills? Our experienced Eastern Suburbs Locksmith team are on call and available 24 hours a day / 7 days a week. For a reliable and immediate emergency mobile locksmith service at a competitive price, contact us today. By focusing our services to stay within and across Sydney’s Eastern Suburbs, in an emergency one of our friendly locksmiths won’t be too far away. Don’t risk the safety of you and your valuables. If you find a broken or tampered lock anytime of the day or night, give us a call, we’ll have one of our 24 hour locksmiths come out to you in no time. 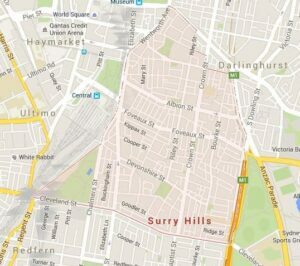 Surry Hills is surrounded by the suburbs of Darlinghurst, Chippendale, Haymarket, Moore Park, Paddington and Redfern. Home to a diverse range of restaurants and cafes catering to a wide variety of cultures; a long list of pubs and clubs; a selection of heritage buildings; and filled with Victorian terraced houses, Surry Hills is a popular inner city suburb. When residing in a busy suburb such as Surry Hills Sydney, maintaining your residential or commercial locks and security systems is an absolute must. When was the last time you had yours checked by a professional? A lock that has been tampered with might not look that badly damaged to the untrained eye but if left unrepaired, can provide an easy entrance for unwelcome intruders. Our qualified mobile locksmith team will take care of any type of lock repair, from sliding doors and window locks to car and garage locks. Our mobile vans stock everything you can think of – padlocks, combination locks, letterbox locks, safes and much more. For added security, we supply and install the more advance locking systems such as master key and access control systems. For more information, give us a call or complete the form on this page.